In 1812, Massachusetts Governor Elbridge Gerry took a step toward immortality by signing into law a redistricting bill that favored his Democratic-Republican party. Yeah, go figure that the [pick one]s did it first! 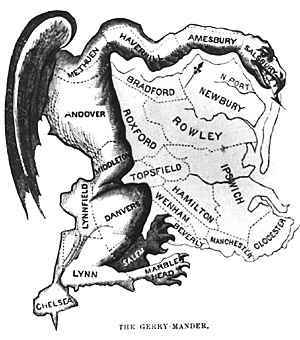 The Boston Gazette coined the term and published the cartoon and long after the man lost his hard G we're still scratching our heads about how to get rid of Gerrymandering and reinstate impartial and sensible congressional districts. Let's deal with problem 1 first. There are numerous pseudo-objective proposals out there that seem nice at first, but in reality favor one party over another. For example, building the districts around population centers seems like a good, simple way to do things. But who tends to live in the middle of population centers? Well, Democrats. So the first district centered around Philadelphia might very well contain 80% Democrats — the Republicans might gladly concede this district to get several 60% Republican districts in return. So it has to be simpler than that — moreover, we might want to lose the notion that keeping things like cities in one district is necessarily a good thing. In fact, objectivity should be the main goal so that no one party gets a systematic advantage over another and any imbalances would be small and only come by chance and therefore most likely even out over the course of 435 districts. After objectivity, the only thing we're going to care about at this point is convenience. As much as possible, we'll try to make the districts connected sets. In the above, we could flip a coin for horizontal/vertical at the beginning in case anyone thinks a north/south split instead of an east/west split favors one party over the other. The only problem we have — given the regular shape of most of our states — is with a few islands and peninsulas. Basically Hawaii, New York, Massachusetts, and maybe Florida. Some simple adjustment to treat islands as blocks, for example, ought to do the trick, but we can work out the minor details later. The Mithrimander is perfectly objective, simple to implement, and creates mostly connected districts. It doesn't go out of its way to attain questionable goals (e.g., creating "competitive" districts or keeping cities/counties together). The only worthwhile goal is to ensure that the people are fairly represented in Congress. That leaves us with problem #2. How to get the powers that be to adopt this simple, objective proposal. We'll have to leave that one for tomorrow. I like it, for all the reasons you've supplied in your antepenultimate paragraph (except for the last sentence, which I'll get to in a minute). The barriers to getting it done are, of course, considerable. The most obvious is the two parties' shared interest in preserving the districts as they are, given that they've been drawn to carve out such comfortable incumbencies that even vapid personalities like Michele Bachmann can win reelection. And of course the task of district-drawing is assigned to the several states, so you'll have to undertake 50 separate efforts at heroic persuasion rather than just getting it done once. Here's what I think is more interesting, and maybe it's something you can address in your plan (or your defense of it). Given how info-laden and sophisticated these parties are, they'll both have a strong read on the sort of outcomes this sort of partitioning would generate. As a result, even though to you and me this seems reasonable, neutral, and fair, in any given state we can expect that one party might wholly support Mithrimandering, whereas the other will regard it as a Trojan Horse — based entirely on their reading of the demogeography. Indeed, I can imagine a situation in which one party would make considerable gains on the other if the first state-slice were made longitudinally. You've arbitrarily (I assume) decided to go with a first latitudinal cut. There's room for argument on this point, and argument there will be, if the facts call for it. You can politicize anything: consider what I've written in the past about "strict constructionism." One side loves it, because (1) it leads to the outcomes they like and (2) they're able to rationalize away these outcomes as the result of a "neutral" interpretative tool. The other side hates it, because it's a Trojan Horse. To be fair, the Mithrimander proposal is a lot more transparent and a lot less susceptible to perversion than the application of strict constructionism. But the point about politicization still stands. Note that this isn't an critique of what you've proposed per se — it's more of a critique of everything else in the world. So take it as such. I do have a critique of what you've proposed, and it has to do with arbitrariness. Why all the concern for right angles and north-south and east-west axes? Just because they're simpler and prettier? That would be a fine reason, in your view, because it's so abstracted from what we generally agree ought to be impermissible bases for making district-drawing decisions. But I don't agree that "the only worthwhile goal" is to ensure fair representation. We want our congressmen and -women to go to Washington to represent our local interests. Surely the case can be made that if one of your lines splits a city in half, such that there are two districts, each with half the city and a big chunk of surrounding suburban and rural areas, local interests aren't as well-represented as they might be if one district drew entirely from the city center, and the other from the 'burbs-and-sticks. Why wouldn't a system that drew concentric circles outward from the city centers be at least as attractive? It would be more complicated to resolve, but potentially more responsive to local interest. Or am I taking us right down the slippery slope to gerrymandering? The latitudinal cut is arbitrary. That's why I suggest flipping a coin. You could even flip a coin at each step. One set of coin flip outcomes might favor the Dems, but by putting in the randomness, it's very hard to rig and very hard to complain (well, easy to complain, but harder to convince anyone reasonable that your complaint is legitimate). The expected absolute benefit to either party would be smaller if the outcome were the result of several independent coin flips. Just have Ernst and Young preside over the coin flips or something like that. The problem is — as you mentioned — going from a system gerrymandered to favor one party to a system that is objective. If you go from a system that gives the Republicans one more seat than they would get under a fair system, well then the Republicans are going to complain. I do not think rectangles are inherently prettier than circles, and they are certainly not simpler (a circle needs one parameter; a rectangle two). But you can't cover a state with disjoint circles the way you can with the rectangle-like (the parts on the boundary will of course not be straight and right-angled) Mithriblocks. Your idea about circles starting at city center was addressed above in my example of "pseudo-objective" solutions. That first circle might very well be 90% Democrat because it's all inner city. That's why we want to avoid anything that picks out certain features and focuses on them — this makes it too easy to manipulate for partisan gain. Moreover, if you really did concentric circles, that second district would be a ring, which I don't think is ideal in terms of convenience (more convenient than, say, randomly assigning each individual to a district, sure, but still not very convenient). You say splitting up a city makes city interests potentially less represented. I don't know about that. They'd have less representation in each district they were in, but in more districts. I don't know that it's inherently better to have a "city" district and a "country" district. You'd have one representative voting "city" interests and one "country" interests with no reason to ever compromise. It might be better to have two moderate representatives who have to appeal to broader interests. I don't know for sure that splitting interests is a better outcome for the world, but I don't see that it's obviously not — and I prefer a system that ignores these types of things in favor of objectivity anyway. Geez. Did I even read your post? You anticipated and accounted for half of what I wrote — and I wrote it all anyway, like I'd had some great revelation. I did read the post: I swear. I just didn't go back and read it again two days later when I wrote the comment. But to your last points — I think there is something to the view that the more uniform the interests are, the better represented they will be. This is the underlying rationale for having congressional districts (indeed, a Congress) in the first place. And you have accepted a certain amount of this, by choosing to work within the district framework. After all, why hang on to districts, if we're going to radically overhaul the system? The district framework is not constitutionally mandated: Article I, § 4 simply leaves matters to the states, while vesting Congress with the authority to override the states' judgments on how to elect their representatives. (It's a federal statute that inflicts the district framework on us.) So it might well be possible, notwithstanding what I wrote earlier, to implement the Mithrimander fix in a single federal statute. If you were interested in abandoning local interest entirely (and I don't think you are), you could dispense with the districts and simply have all the voters in a given state vote for all that states' representatives — subject, I suppose, to the caveat that this approach might overempower voters in, say, California, because they're electing 53 representatives, whereas in Alaska it's just one (although I don't think that system would raise any constitutional issues — it would just piss people off). But I suppose your approach does the job of optimizing local interest representation under 'mander-pure conditions. I'm not interested in abandoning local interests. I think districts are good for that — and better obviously than just everyone in the state voting for everyone. You will get at least local interest from the Mithriblocks (yes, I like typing that word) — you just might not get specific group interests such as city or merchant (from back in the day). But it will certainly be local. I'm glad that this could all be done by federal statute. We'd have to do some analysis, but as long as the near-term impact didn't change the expected breakdown by much, there's hope. And of course, you make this take effect ten years down the road so no one needs to vote their self-interest by voting against. One more thought on shape. An advantage of Mithriblocks is that they will all be rectangularesque. The way you can tell a Gerrymandered district is by its odd shape. So it will even look fair and objective to a casual observer — this might not be true for some complex arrangement involving several circles around different population centers. There is something to be said for transparency, I think. DEA Busts "Merchant of Death"
Yes, But Do We WANT Personalized Web Search?